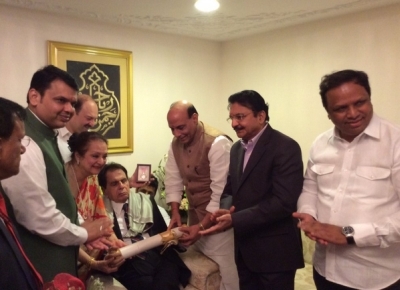 Ailing legendary actor Dilip Kumar, known as the "tragedy king of Bollywood", was on Sunday presented the Padma Vibhushan by Union Home Minister Rajnath Singh at the thespian's residence in suburban Bandra for his contribution to the Hindi cinema spanning over six decades. The 93-year-old veteran, who shot to fame with "Naya Daur", "Jugnu", "Andaz" and "Devdas", was presented a medal, certificate and shawl by Singh in the presence of the actor's wife Saira Bano. Kumar, in a black suit, could barely open his eyes and was helped by Saira when the national honour was conferred on him. He has given sterling performances in over 60 Hindi films. Maharashtra Governor C Vidyasagar Rao, Chief Minister Devendra Fadnavis, were among other dignitaries present at the actor's home when he received the award. The announcement to honour Bollywood veterans Kumar, Amitabh Bachchan and a few others with the prestigious Padma Vibhushan award was made by the government on the eve of Republic Day on January 25, 2015. However, Kumar, due to ill-health, could not attend the special function held at the Rashtrapati Bhavan in April when other Padma awardees were honoured by President Pranab Mukherjee. Born as Muhammad Yousuf Khan in Peshawar(Pakistan), Kumar made his debut as an actor in the film "Jwar Bhata" produced by Bombay Talkies in 1944 . He starred in films of a variety of genres such as the swashbuckling "Aan" (1952), the comical "Azaad" (1955), the historical "Mughal-e-Azam" (1960) and the social "Ganga Jamuna" (1961). He also did films like "Ram Aur Shyam" (1967), "Kranti" (1981), "Shakti" (1982), "Karma" (1986) and "Saudagar" (1991) and others. His last film was "Qila" (1998). The Government of India honoured him with the Padma Bhushan award in 1991, the Dadasaheb Phalke Award in 1994 and the Padma Vibhushan earlier this year, for his exceptional and distinguished contribution to the Indian cinema. Bachchan told reporters here, "I have been a huge fan of Dilip Kumar since many years. It's a very proud, happy moment for all of us... When the history of Indian cinema will be written, it will be before Dilip sahab and after Dilip sahib."